يوفر فندق Crown Promenade غرفًا فسيحة مع إطلالات على خليج Port Phillip أو المدينة أو نهر Yarra. ويمكن للنزلاء الدخول إلى مطعم وبار ومسبح داخلي وجيم. جميع الغرف في فندق Crown Promenade Melbourne تحتوي على حمام داخلي فاخر، وتلفزيون بشاشة مسطحة بحجم 42 بوصة مع قنوات الكابل وميني بار. وتتوفر خدمة الواي المجاني عالي السرعة. يمكن للنزلاء ممارسة التمارين الرياضية في الجيم المجهز بالكامل أو الاسترخاء بجانب المسبح الداخلي مع إطلالات على أفق المدينة. وتتوفر غرف البخار ومُدلِّكة. يقدم مطعم Mesh مأكولات جديدة متميزة في المناطق الأنيقة المحيطة به، ويحتوي بار Tonic على تراس في الهواء الطلق، ويقدم الكوكتيلات حتى وقت متأخر. يقع فندق Crown Promenade في منطقة Southbank الحيوية في Melbourne، ويتصل بمجمع Crown Casino and Entertainment مباشرةً، والذي يوفر مطاعم عالمية وبارات ومناطق تسوق. Crown Promenade has a really good location. However, I believe that the hotel is overpriced. 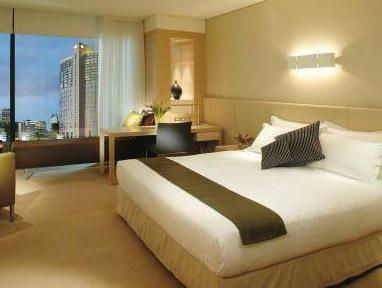 The rooms are usual, just like the other hotels around Melbourne. Maybe the only thing that stands out would be the floor to ceiling windows that show exemplary views. Overall, I would recommend it to friends and family but I would inform them of the price. The location is not good, because we try to find a nearby restaurant for half hour. Had a good stay here, room was clean and big enough, the location is great. Had an issue with Valet parking. The guy took our keys when we arrived and gave us a blank ticket. On checkout we were charged over $30 and when we questioned the charge the manager was rude and arrogant and told us it was on the ticket which it wasn't. Paid the charge and spent the next week trying to remove tree sap from the paintwork. Park at the Casino its cheaper and not under trees. Amazing. I stay here often when I need a quick get away from the stresses of life. The pool area with sauna and steam and gym are amazing & open til 9pm so you can have a relaxing swim before bed. It's very peaceful. 3 of us ladies stayed here together & totally enjoyed ourselves, beginning with drinks in the Tonic Bar & ending up with excellent breakfast in Mesh Restaurant. We all slept really well on comfy beds and enjoyed the view. Crown Promenade is a favourite of ours & we'll definitely be back! 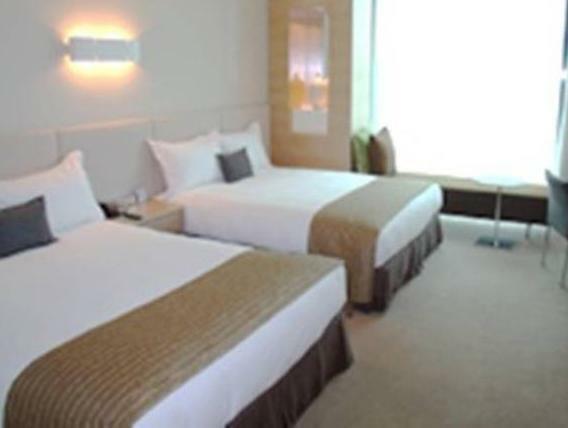 Our stay with my friends in Crowne Prominade is one of our best holiday ever. Love the place and cannot wait to go back again. The service of the staff is impeccable and I cannot see any flaw of the staff. Really love the hotel. From a smooth seamless check-in to the same kind of check-out, our stay was excellent. Great staff, really clean room with excellent views and perfect location for our conference within the Crown complex. Bar fridge is the "evaporator" type when means it does not get very cold (such as 4 degrees as a typical fridge would). At best it was 10 degrees, meaning beverages were not cold. This was confirmed by room maintenance. Melbourne is very diverse with many locations of interest. We found that staying here was a pivot point to visit many different locations. The trams are right outside, Uber is here, the taxi's are close by or of course you can walk. $400 per night got us the 19th floor with a corner king. It was pleasant. We were celebrating our 30th wedding anniversary which is the day before Valentines day so I am sure that pushed the price up a little. We stayed for 5 nights, great staff, terrific views and we would stay again. Great location and comfortable facilities. Close to all the entertainment we look for: music;movies; fabulous restaurants and people watching. Magnificent views across the Yarra to the Melbourne CBD skyline. It was a great one night escape for myself and my 3 nephews - Value was affordable for us in comparison to other Accommodation in Crown - and it was stress free - no driving from the time we left our car until it was delivered to us at the end of our stay - we didn't have to leave the complex - eating, bowling, movies, swimming, river walk - it was all here for us. I have stayed a Crown Promenade many times. Although the decor and finish of the rooms is starting to get rough around the edges and a little dated - this is still my first choice of hotel when I stay in Melbourne. The price is reasonable, service world class and the hotel's proximity to CBD shopping, transport hubs and Crown complex is unbeatable. Will continue to stay here, although a fresh lick of paint would be appreciated.